Larry J. Sabato's Crystal Ball » HOW SHOULD WE VOTE? In an earlier thought experiment for this site, I examined the history of multiple-member and statewide at-large districts in congressional elections, and wondered whether a movement away from the near-universal use of single-member districts (SMDs) in American legislative elections might be advisable and politically feasible. Electoral systems that feature SMDs with plurality rule — like the United States and Great Britain — tend to gravitate into two-party duopolies, a situation that frustrates third-party supporters and self-identified independents. Despite being paralyzed by polarized politics, policy gridlock and low approval ratings, the furthest thing from the minds of members of Congress is a reform campaign to alter an electoral system that, by definition, has made them winners already. District magnitude is only part of the equation, however. Given pervasive gerrymandering and a shrinking number of competitive districts, any serious reform of congressional elections might also entail changes to our voting rules — that is, how votes are cast by voters and aggregated to determine winners. Voting rules reform wouldn’t automatically guarantee better candidates, more electoral competition, higher voter turnout, lower citizen apathy or a more responsive and responsible Congress. But it almost certainly couldn’t make matters worse. So what sort of voting rule reforms might significantly alter the composition of Congress, encourage greater voter participation and create a more responsive national legislature? Any discussion of voting rule reform must begin with the important realization that changing voting rules would not only alter outcomes because of how votes are aggregated, but could also affect the behavior of voters in two ways. First, election rules affect the incentives and thus likelihood that voters will turn out to vote. Second, and relatedly, changes could affect how voters express their preferences once they do turn out to vote, especially if they are able to indicate secondary and alternative preferences and therefore vote strategically. Starting with turnout incentives, voters in single-member, plurality rule U.S. House districts that are also highly gerrymandered often have little incentive to turn out. A perceived lack of electoral importance may be a strong deterrent to registered Republicans in heavily Democratic districts (or vice versa), non-white voters in overwhelmingly white districts, female voters facing a ballot on which all nominees are men, or third-party or independent voters in nearly every House district. There may be other elective offices — like the presidential race — or ballot measures that induce a voter to show up on Election Day, of course; but if the results in these contests also seem pre-ordained, there is little reason to vote. Other countries employ a variety of alternative voting rules, including at-large, multiple-member districts with plurality voting, majority-rule runoffs in single-member districts, instant runoff voting, approval voting, proportional representation, and transferable vote systems, among others. A few exceptions aside, however, the United States features the near-universal use of SMDs with plurality rule. Voting rule experts and electoral reform advocates believe alternative systems would encourage higher voter participation rates and create more competitive elections. Given America’s comparatively low turnout rates, it’s hard to imagine participation rates falling much further. The critique of single-member, plurality-rule systems is that they both discourage and preclude the expression of secondary preferences, thereby reducing participation rates and reinforcing the power of the two dominant parties. Independent or alternative gerrymandering procedures, argues Rob Richie of the electoral non-profit FairVote.org, might help but alone are insufficient. “Any assumption that nationwide independent redistricting commissions would do away with partisan bias would only hold true if a commission’s only priority was fair partisan representation,” Richie wrote recently in Salon. FairVote advocates the use of multiple-member districts and some form of instant run-off voting (IRV) — in which voters can indicate preferences of not just their favorite candidate but also secondary (and so on) preferences — in the belief that it would produce winners more aligned with voters’ actual ideological-partisan attachments. The good news is that there is a limited history of using IRV by some American states; the bad news is that its use is, well, rather limited. As for the second effect — the strategic voting implications of alternative voting rules — there’s no doubt that if alternative voting rules were adopted, American voters would need to think differently at the polls. Consider the simplified scenario below featuring nine voters (R through Z) and eight candidates (Adams through Harrison), and the outcomes under five distinct voting rules: (1) single-member district plurality rule; (2) two-member district with plurality rule; (3) majority rule run-off; (4) approval voting; and (5) Borda count. For each voter, their preferences for the candidates are ranked, highest to lowest, from 1 to 8, as shown in Chart 1. 1. Single-member district with plurality rule: Buchanan has the most first place votes, with four. Winner: Buchanan. 2. Multi-member district (two members) with plurality rule: Buchanan finishes first, Fillmore second with three votes. Winners: Buchanan and Fillmore. 3. Majority rule run-off: In a single-member district with majority rule run-off, and presuming the top two finishers proceed to the run-off, Voters U and V would decide between the top two vote-getters, and both prefer Fillmore to Buchanan. Winner: Fillmore. 4. 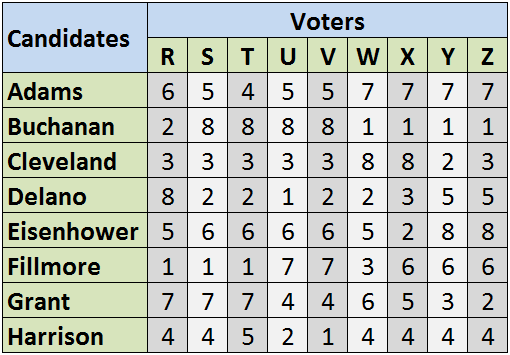 Approval voting: For sake of argument, stipulate that voters approve of any candidate they rate among their top three preferences, and approval votes count one each for either a first, second or third preference. Cleveland is rated in the top three by seven of the nine voters. Winner: Cleveland. 5. Borda Count: Similar to the method used by writers and coaches to rank NCAA college football teams, points are assigned in inverse order to ranking. In our example, that means 8 points for a top preference, 7 points for a second-highest preference, and so on. Delano has the highest Borda count (1 first = 8, + four seconds = 28, + one third = 6, + two fifths = 8, + one eighth = 1, yielding a total of 51). Winner: Delano. If not already evident, the intentionally-contrived exercise above demonstrates that voting rules matter: Without changing the number of voters or their preferences, five different rules produced five different outcomes. Political scientists and political theorists can debate which voting rules produce the “best” or most “fair” translation of votes into seats. But the overarching fact remains the same: Changing the rules for election members of Congress (or any other legislature) potentially changes the composition of the legislature. The real question here is not whether voting rule changes would dramatically affect congressional election outcomes, but whether there is any sort of political will to fundamentally restructure the way we elect members of Congress. Despite the earnest efforts of FairVote.org and other electoral reform advocates to move legislation through Congress or the state legislatures, what is probably needed first is a widespread voter education effort. Americans seem relatively attuned to, and frustrated by, certain electoral realities, including pervasive gerrymandering, the rising power of campaign money, and the related advantages enjoyed by entrenched, well-financed incumbents in safe districts. But it is precisely because the “permanent Congress” is viewed as the byproduct of strategic mapmaking and the perverse influence of campaign money that distracts from the potentially salutary effects of structural electoral reform. Election reform advocates must first get Americans to properly recognize that the roots of the problem reside as much in the voting rules as in campaign finance law or the redistricting process.